Oneof my mother's favourite mottos is, "Kill 'em with kindness". She firmly believes that you don't have to play the macho game that involves tearing people down to get places in this world. It serves her well. She is a senior General Manager in a Fortune 500 company, loved and lauded by most who know her. Well, when your personality fails you, what do you do? Start somewhere! In my case, it was this apron that could have no other meaning. 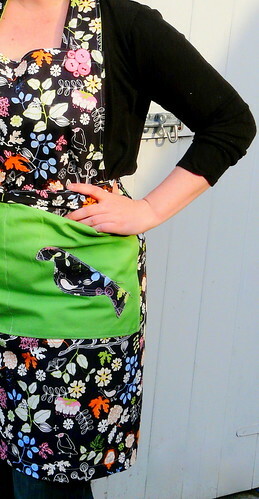 Girly fabric and details + butcher's apron pattern* = Kill 'Em With Kindness: The Apron. I think its a good first step. Because kindness, like charity, begins at home. * alterations to the original pattern made at the pocket and neck strap.